Home > Blog > Real Estate Email Marketing With IXACT Contact Keeps Getting Better! Real Estate Email Marketing With IXACT Contact Keeps Getting Better! In August, IXACT Contact became the first and only real estate CRM to include Email Campaign Reporting. 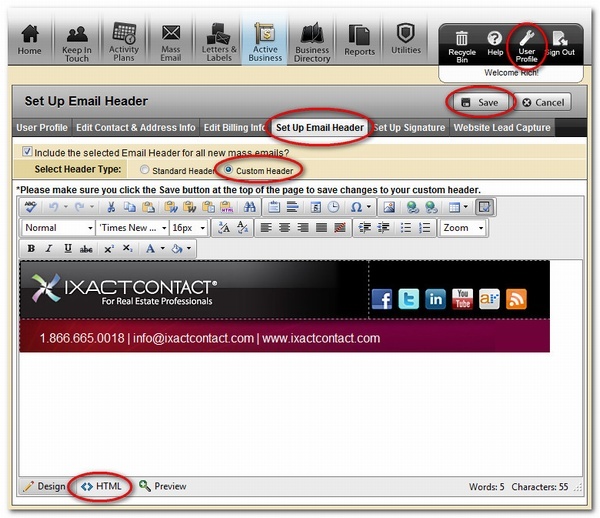 IXACT Contact has always made it extremely easy to create an email header. Upload your photo, upload your logo, and ‘presto’ you’re done. Today we’re giving you new flexibility to create your own graphical design or upload a professionally designed graphical email header/banner into the system via HTML. If you take advantage of our Automated Website Lead Capture tool, you can also choose to include your new custom email header in your lead capture form, giving you a consistent brand look and feel. And last but not least, email and letter signatures. They are now ALSO fully graphical and customizable, just like email headers. With just a few clicks you can make your signatures as colourful as you are creative! Our goal at IXACT Contact is to offer the best real estate contact management system available – period! With the release of custom graphical email headers and email/letter signatures, IXACT Contact continues to add important new capabilities and functionality to a system already widely known and admired for its simplicity and ease of use. If you’ve been thinking about trying IXACT Contact, now’s the time! Questions? Feel free to contact us at 1.866.665.0018 or info@ixactcontact.com.